Upper: Tightly woven forefoot mesh, Flywire cord based lacing system, two layer mesh from midfoot to heel. 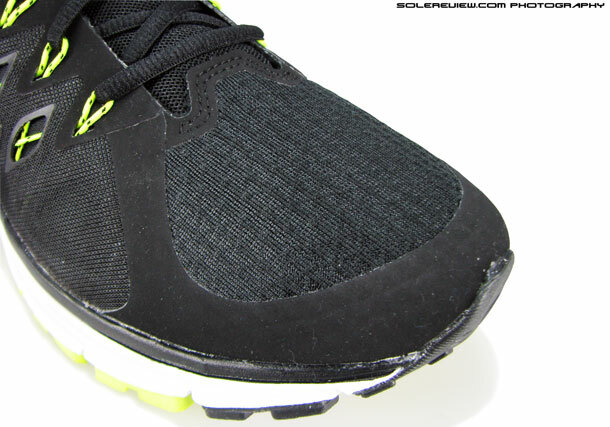 Midsole: Cushlon foam (EVA), Zoom air bags in heel and forefoot. Outsole: Blown rubber in forefoot, Carbon rubber in mid-foot and heel. Weight: 337 gms/11.89 Oz for a half pair of US 11. The Nike Zoom Vomero 9 feels stale, carrying over the same sole unit from Vomero 7. The ride is firm (for a Vomero) with a stiff forefoot, and the tongue slides around. Silver lining is improved heel fit, but you'd still question the need to spend $130 for a shoe which feels no different from the 2012 version. Our advice? Don't buy, and hunt for Vomero 7 and 8 bargains. The true purpose of a shoe review is fairly straightforward. It just tells you how good or bad a shoe is, which in turn helps you decide whether to spend your greenbacks or save them for something better. So with that context set, we’ll come directly to the point without bantering with adjectives, metaphors and fancy words. Should you be buying the 2014 Nike Zoom Vomero 9? Our answer is a resounding no, and we can’t recommend this shoe in good conscience. For three reasons, chiefly. Firstly, the Zoom Vomero 9 achieves the rare yet dubious distinction of carrying over the SAME sole unit for last three years. Yes, you heard that right. The 2012 Vomero 7 featured the then brand new midsole/outsole, which subsequently did cushioning duties on 2013 Vomero 8 and then finally (and shamelessly, if we may add) showing up on the 2014 Nike Zoom Vomero 9. This shoe is as fresh as a dish cooked last week and then refrigerated. Eating it won’t do you any harm, might have some nutrition left and look presentable too, but there’s no escaping the staleness of the situation. We spent $130 on the Nike Zoom Vomero 9 just because we had to review it, painfully aware that comparative shoes from other brands came with brand new uppers and outsole updates. Carrying over an outsole for two years (the case with many Nike shoes) is somewhat acceptable based on precedence, but three years is unadulterated sacrilege. Especially for a shoe priced north of $100. Two, Nike seems to have forgotten what the goal of the original Vomero was. If our memory serves right, the first few Vomeros were standard bearers for superlative cushioning and cocooning plushness. An epitome of a superior, neutral running shoe. The last few years has been unkind to Vomero. Every successive version saw the shoe being gradually flayed of its once luxurious richness, with the 2012 Vomero 7 hitting rock bottom. The 2014 Vomero 9 feels more like a stability shoe with some bounce in the sole, married to an unremarkable upper. Nike has completely lost the plot with the Vomero, and we think it might actually be a good idea to put the model down instead of dragging it through the years. After all, there are shoes within Nike’s own product line which fits Vomero’s original job description. Example? The Nike Air Pegasus 30. Three, there are far better alternatives to the Zoom Vomero 9 which outclass it in every way possible. If you are a Nike loyalist and wear nothing other than swooshes on your feet, then look no further than the discounted Vomero 8, and basement bargain Vomero 7. They do the same job at a far lesser price. The Air Pegasus 30 is a good neutral running deal at $30 cheaper, and that shoe still remembers why it’s here in the first place. Or consider the brilliant Air Pegasus 31, a full upgrade over version 30 and with a heel which looks exactly like Vomero 9’s. Look past the swoosh, and models like the Asics Gel Nimbus 15/16, Brooks Glycerin 11, and Adidas Energy Boost shine bright like lighthouses. Those shoes deliver the promised experience in a far more competent package than Vomero 9. Our scathing criticism of the Vomero is now bordering on embarrassment, but these words reflect exactly what we think of the shoe. We’ll still cover the updates on the Vomero 9, in case you were wondering what’s ’new’ in the 2014 version. The 2014 Zoom Vomero 9 completely overhauls its upper. Mid-foot cinching system is overhauled, with Vomero 9 shifting to a Flywire lacing arrangement from last year’s dynamic support. The mesh is changed from a spacer type to a kind which is more tightly knit and has less compression when squeezed. The thin Hyperfuse layers have been replaced with regular, adhesive bonded synthetic overlays, making the Vomero 9 look a tad more conventional. With Dynamic support straps gone in the mid-foot, the design now features diamond shaped cut-outs with the Flywire cord’s showing through. Eyelets are traditional punched-in holes on the upper, with loops of the Flywire cords lined up against it. The laces go over the tongue which is shorter than last year’s Vomero, and comes un-gusseted with the reflective lace loop missing. 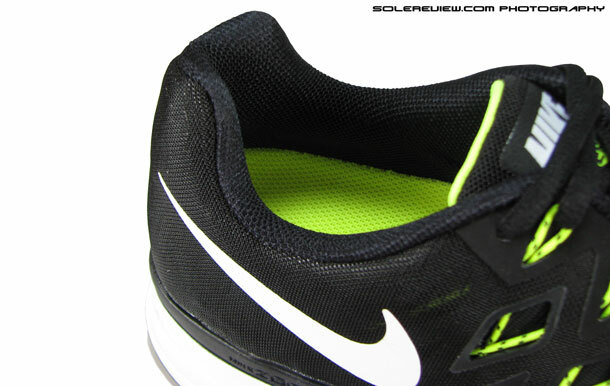 Heel and forefoot Zoom Air bags inside the midsole. Heel has a piece of cardboard over Zoom Air. 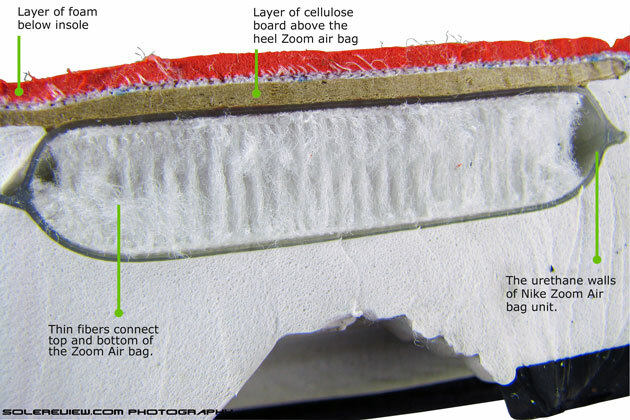 Cross-section of the heel Zoom Air bag. The bottom unit hasn’t changed at all. We’ve covered all in our Vomero 8 and 7 reviews, but for everyone’s benefit, here’s the lowdown. The midsole is a single piece Cushlon foam which looks like it’s made of two parts because of paint on the upper portion. The heel and forefoot have zoom units, with the plastic stability piece under the arch side. Rear of the outsole is Nike’s BRS 1000 compound, a type of carbon rubber (marking) which is used by the brand around high wear areas. Forefoot outsole is blown rubber, or Nike Duralon in brandspeak, which is softer than BRS 1000. Rubber lugs are of the rectangular kind, with generous amounts of Cushlon showing through the flex grooves. Though this is a three year old sole design, the Nike+ callout is not longer visible under mid foot and the familiar red cavity under left insole is gone too. Instead, the pocket has been filled with a foam plug. The midsole continues to be topped off with Nike’s Fitsole 3 insole which gives satisfying levels of padding and support with its tri-layered construction. Firm layer at the bottom, a lighter density foam above it and covered with a smooth fabric. Running in the Vomero 9 results in an overwhelming sense of Deja Vu. It rides like the Vomero 7 and 8, because well, uh, the sole unit is exactly the same. Heel cushioning is firm, with the foot resting over a heel Zoom air unit encapsulated in a single layer of Cushlon midsole foam. A piece of hard cardboard sits between the Zoom Air bag and heel, and that is the reason why the padding feels slightly stiff. 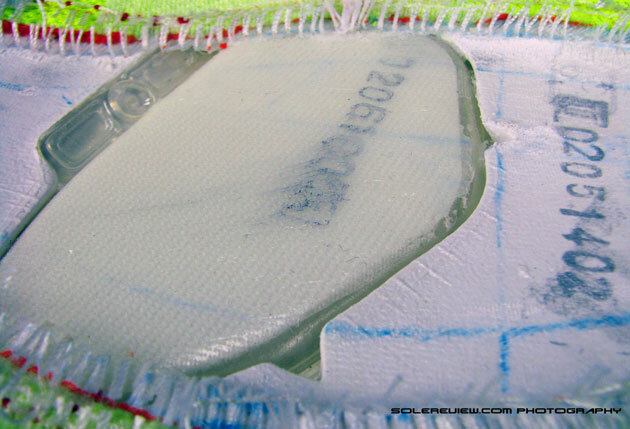 This sole unit does not have the separate foam crash pad of Vomero 6 and earlier, so landings are no longer pillowy soft – part of older Vomero’s appeal. Forefoot feel is not ideal too. 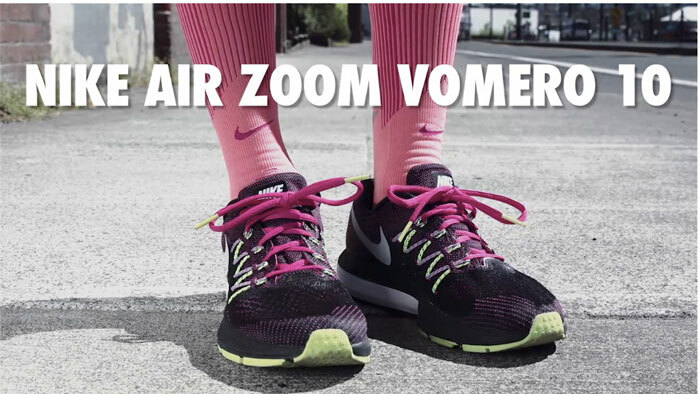 As we’ve pointed out in our reviews of the 2012 and 2013 Vomero’s, the Zoom Air bags reduce forefoot flexibility. It also gets in the way of smooth heel to toe transition, with a lumpy sensation felt underneath at slower speeds. You can literally feel the Zoom Air bag as a separate component underneath while in motion. On the brighter side, grip is good on the Vomero, with lots of rubber lugs positioned between the heel and toe. Rearfoot is regular carbon rubber, and the forefoot gets Duralon, a kind of blown rubber which is softer. Durability also scores high with rubber covering the expanse of the outsole. Upper plushness goes down by a few notches due to mesh swap, and use of the Flywire lacing system which tends to apply localized pressure on the mid-foot. We preferred the Dynamic support straps used in the Vomero 8 which distributed mid-foot compression much more uniformly. The tongue continues to be de-attached from the upper, and lack of a gusset has the tongue sliding to its side after a few minutes of running. The tongue is shorter than the Vomero 8, but we didn’t feel any negative effect on the performance. Heel is one area which the Vomero 9 does better than the 8. The collar grip has improved dramatically because of the narrower heel counter molding . 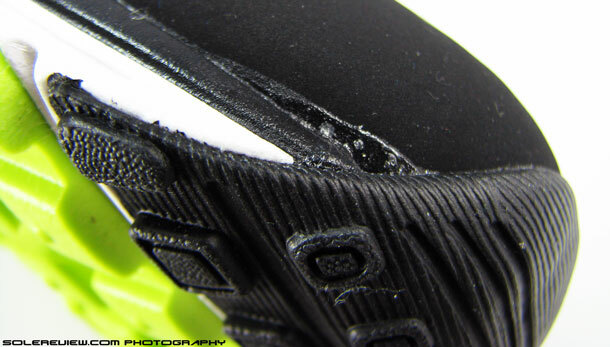 The collar of the 2013 Vomero 8 was molded very wide, which caused the foot to move around during runs. 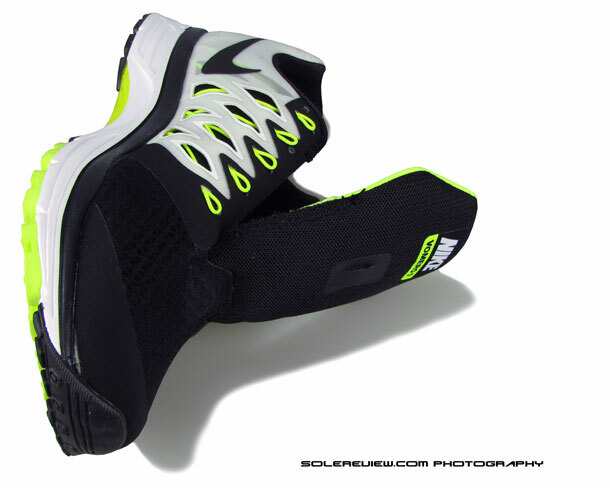 The Zoom Vomero 9 modifies counter molding to reduce the open space between both sides of heel. The result is a much improved fit around the ankles, with no heel slippage observed during our test runs. But then a shoe is sum of parts. Add everything up, and the Vomero 9 fails to meet our expectations. The expectation of being a plush, neutral running shoe which betters older Vomero versions. The expectation that every step should be one of supreme ride comfort and luxurious fit and feel. The expectation of the satisfying feeling of $130 well spent. The 2014 Vomero 9 does none of that, and that is sad. Because we know it is possible. Six years ago, the Vomero 3 shone bright over anything else in mesh and foam, and Vomero 9 could have been a torch bearer of that legacy. But unfortunately, it is not. A) Un-gusseted tongue: The inner sleeve was last seen on Vomero 6, and hasn’t made a comeback yet. Which means the Vomero 9 has a tongue which slides. A lot. 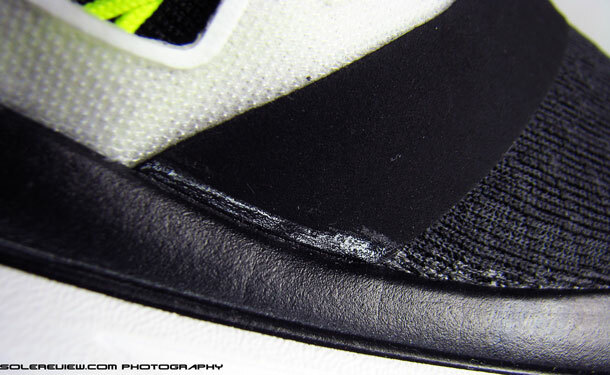 B) Sub-standard finish: The upper is full of ugly glue marks, mostly at the area where upper joins the sole. This could also be due to the change in materials, where it is harder to rub off the glue after assembly. Poor material selection, in that case. C) Upper mid-foot design: The diamond shaped cutouts do not sit flush with the foot surface on the arch side. They bulge out, making the area look loose. D) Stiff forefoot sole: The Zoom Air bags get in way of flexibility and makes the sole under the forefoot stiff, despite the flex grooves. E) Reduced reflectivity: Night-time running elements tones down in coverage. 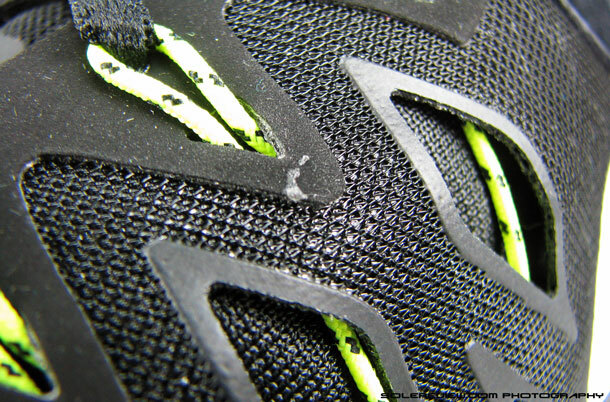 The tongue lace-loop is now non-reflective, and heel area sees reduction in reflectivity. The Nike Zoom Vomero 9 is a pitiful shadow of its once glorious past, degrading to a shoe which neither belongs in upper echelons of neutral cushioning nor in the category which combines support with cushioning. At $130, it will be a purchase decision you will likely regret. Our suggestion is that you buy the 2012 Vomero 7 which is a comparable shoe available at a close-out price, or the Pegasus 3o. Or you can choose fish to for options in Adidas, Asics, Brooks and Saucony. Maybe even Puma. Don’t support the Vomero 9 by buying it, else you’ll encourage another version of evolutionary apathy in 2015. Given that our review ripped the Vomero 9 on so many levels, you might be surprised at the relatively higher score. But our rating follows a system of fair scoring. The shoe when viewed in isolation is not structurally bad or uncomfortable, with decent levels of cushioning thrown in. So on individual parameters (which have weighted averages, by the way) will add up to the scores they deserve. Variable marking is thrown into the equation after the score sub-total, and in this case, we have deducted points for lack of freshness. We adopt the following methodology: annual outsole refresh will not impact the overall score, outsole refresh every two years will result in a deduction of 0.5 points. But if the sole unit remains unchanged for three years, we impose 3x of 2nd year negative points. In Vomero 9’s case, it is 0.5 x 3 = 1.5 point deduction from a total score of 10. 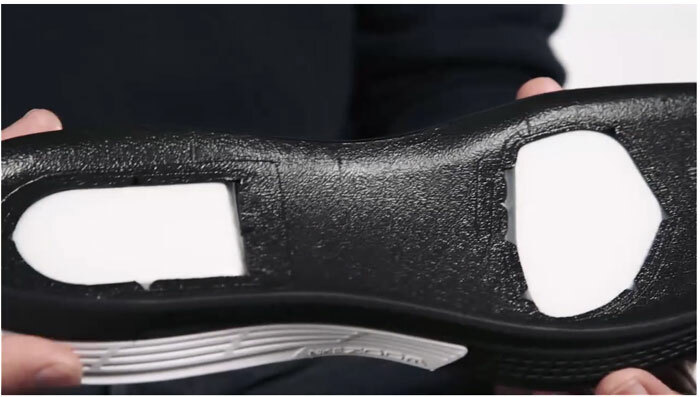 We treat weight similarly, and negative (variable) marking is applied if the shoe exceeds the category median, and/or exceeds the weight of its previous version. We hope to post a comprehensive guide to how we rate our shoes – soon. 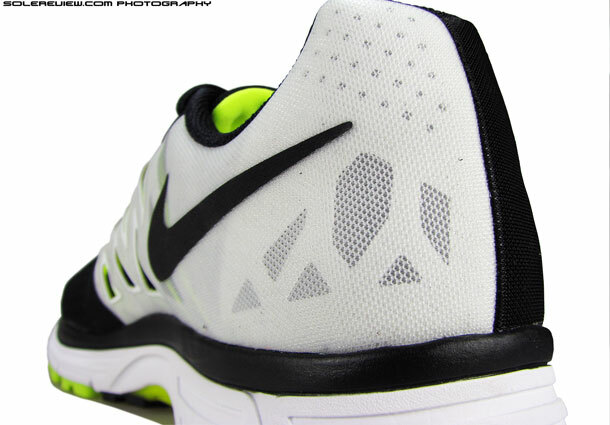 b) Upper features a Flymesh construction, which appears to be a Hybrid between the Flyknit and engineered mesh. It looks identical to the 2014 Nike Air Zoom Structure 18 upper. c) The sole unit is finally dual-density again! Full length heel to toe Cushlon, with a Cushlon blended crash pad under the heel. Rear and front Zoom Air bags. f) The collar mesh is the same as used as Vomero 9, which is soft. f) The sole appears to have a blown rubber forefoot and carbon rubber rear-foot. The ‘crash rail’ design from this year’s Pegasus carries over. Hi i’m thinking of choosing this over lunar eclipse 4 because of the sole. Im not that active, i just want one shoe for running, gym, trail/rough road, basketball and volleyball. Do you think my choice is right? Or do you recommend other brand and model for me? Please help me choose the right shoes…. Hi What should I pick? Vomero 9 or Lunar Eclipse for running in Gym and Trails. A proper trail shoe would be a better choice, like the Nike Zoom Wildhorse. Does it has a Nike+ technology? If it yes how to connect it to smartphone? Hi, the shoe does not have a cavity so it makes the older transmitter technology redundant. If you are using a post 2011-iPod or iPhone, you don’t need to do anything to connect the shoe to Nike+. Just use the app on your device, it has a built in accelerometer. I am a long distant runner and I have been wearing the vomero’s for the past 6 years for the cushioning under the forefoot and for my bunions. I am so disappointed in the lacing and the inflexibility of the mid sole . For the first time in years my the lacing in the 9 are cutting into my feet and one foot in particular is pulling up a little stiff in the arch. The vomero’s was good for the width due to my bunions and there was no seams. Ascis I found too stiff and narrow. I might have to look at the Air Pegases. You must have had the Vomero 4 or 5 with the ‘Bunion’ rings, that shoe was amazing. The Vomero 9 does not even come close. You could fit trial the Pegasus, but which models did you try in Asics? We found the Nimbus 15 quite roomy and cushioned in the forefoot. I have just bought a pair of Vomero 9’s and I completely love them! I have had Etonics and more basic Nikes in the passed but will never go back…Vomero’s are great! Happy to know they work for you, thanks for sharing your feedback! Excuse me, which one is better for 5,10K ruuning among this shoes, Vomero 9 and Pegasus 31? Either should work well enough, but we prefer the Pegasus 31. 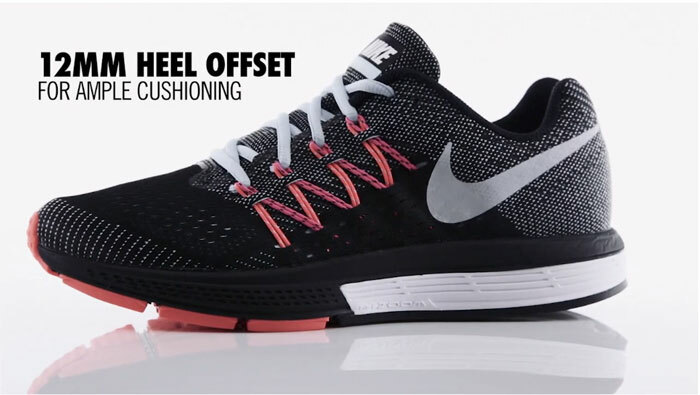 Hi There, I am running the Pegasus 31 Black and I am okay with but I am also looking at the Lunarglide’s because I am a little bit Overpronatie as I see at my shoes today. 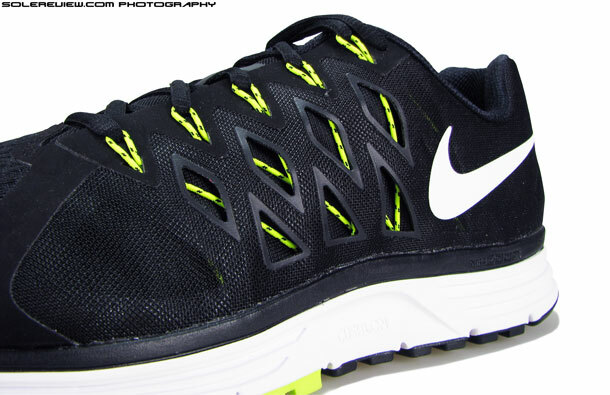 So I think I need a shoe that provides me a little bit support on there.. Is the new lunarglide a good answer or.. Yes, the Lunarglide 6 runs firmer than the Pegasus so might suit you based off what you’ve described! Very often people say that a 2 years old model isn’t a bargain beacause a shoe lose its cushioning properties with time, even when brand new one. I’ve always believed it was just a marketing legend, and your suggestion to pick up a pair of old V8s or V7s seems to indirectly underline the same. Can you explain us if there is some kind of truth behind all this? It used to be true in the days of running shoes using Polyurethane based midsole foams. The foam underwent a chemical process called Hydrolysis and would gradually start deteriorating over time, at times crumbling into little pieces. Not anymore. Athletic shoes these days rarely use Polyurethane, the usage has almost disappeared in the last decade. The foam compounds used these days are extremely stable and have a longer shelf life, five years or more. EVA for example, degrades only based on number of compression cycles (actual use) it undergoes – and not by lying in a box. But there might be an issue with the glue which keeps the shoes together, because the adhesives are still polyurethane. But two years? That is nothing. You should be perfectly ok with V7’s or 8’s. To many people leave discounted shoes on the shelves because of that. Completed 3 runs of 3.5 miles each in the Vomero 9. Concur with the above review, with the exception that I personally do not mind the carryover of the same sole unit nor mind the feel of the air bags. As stated above, the Vomero 9 does feel more like a stability shoe with bounce (excellent description by Solereview). I would say it feels like a Wave Rider with Nike cushlon instead of the wave plate. Pros – Like the lower profile, slightly less weight, and better transition. Cons – The midfoot cinching system/flywire lacing system does put pressure across the midfoot as stated above. For those that prefer a snug fit, this will be fine. But as an underpronator/supinator, the dynamic support system in the Vomero 8 was best for me. I wear a D width in all shoes, but have a narrow foot with a high arch. The Vomero 9 does not fit as comfortable for me as the Vomero 8 and I feel it restricts my foot somewhat like a stability shoe. Breathability is terrible. I have the obsidian/blue/tango combo and my feet are drenched after only a 30-35 minute run. I do not feel it is the color, but the construction, The insoles are already stained after only 3 short runs. Also, the insoles are lighter than the Vomero 8. This was probably due to effort to reduce weight, but it seems to reduce the plush field of the Vomero 8 and gives you the stability feeling. I weigh 185. For someone lighter desiring a snug fitting shoe that may also be used for races due to the excellent transition, the Vomero 9 may work. Summary: If you like the Vomero 8, stick with it. Thank you so much for sharing the very detailed feedback. Agree, the shoe runs warm because of its closed mesh structure. The vomero 9 is a train wreck. I have previously only worn nike but I am so upset with this substandard shoe that I have purchased a pair of brooks. Running in the vomero is like running in a concrete sole.Nike have lost me forever………..
Hmmm…24mm in the rear, 12mm in the forefoot. Interesting design shift. That’s very near to the new Asics Gel-Pursue (21/11). How many make a trend? This is really a great site. Thanks you very much for your in-depth reviews. In the past I was very happy with the Vomero 6, but need a replacement now. Would be the Vomero 9 the right choice or would you recommend another shoe to me? I’m 1.83 at more or less 90 kg. I’m running on asphalt and my typical run is about 8-10 km. With othe shoes I had problems with the knees from time to time, not so with the Vomero 6. Which other shoes you’ve tried in the past and had problems with? You could look at the Saucony Ride 7 or the Asics Nimbus 16, both of which are in the same category of cushioned running shoes. Try them on and see how they feel. We don’t feel the Vomero 9 cuts the grade, considering that version 10 is around the corner. Wow, this was a fast reply, thanks a lot. I’m a bit prejudiced against Asics. 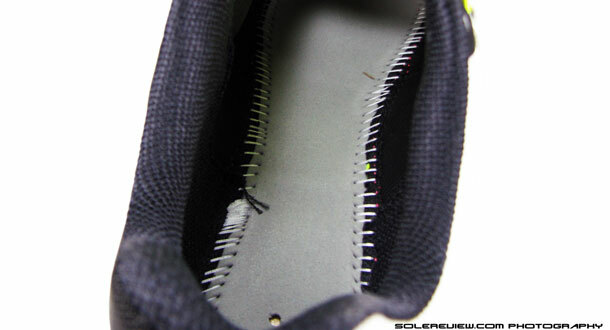 I had 3 pairs of Asics in the past and had always the same problem: after quite a few runs, the fabric of the inner part of the heel area was worn through. The last pair only remains undamaged for 4 weeks before I got a “hole” in the linning of the shoe. Maybe this is also because of my feets, but I hadn’t this problem with Nike shoes. But I will have a look for the Saucony Ride. What about the Pegasus 31? Would this also be a choice for me? Then it makes sense to cross Asics off the list. Along with the Saucony, you could try the Pegasus 31 a try too. We did not recommend it is because it is much softer than the Vomero 6 and the Ride 7. Wasn’t sure if it was stable enough for your knees. Thanks for this awesome review, I was just about to buy these after talking with a Nike rep. I have a really high arch and need a cushioned shoe for a supinator. Are there better shoes for a frequent runner? I don’t do any races if that helps. Thanks! The Vomero 9 isn’t bad, but we’d give the Nike Air Pegasus 31 a try too. Thanks for this thorough review. It makes me miss my Vomero 1 very much. It is purely an one-off shoe, with full length zoom air and control-at-origin forefoot and heel crash pad. No other Nike shoes have the similar design as the Vomero 1. I call Vomero 1 a “Marshmallow” shoe due to the fact that it is the softest running shoe I have ever run in throughout my 11 years of running. Vomero 1 in silver and blue is also very pretty, it is the prettiest Nike shoe I have ever seen, even till today. Vomero 1 gave me wonderful life and running from 2007 till 2010, a motivation to keep me running and competing till today. 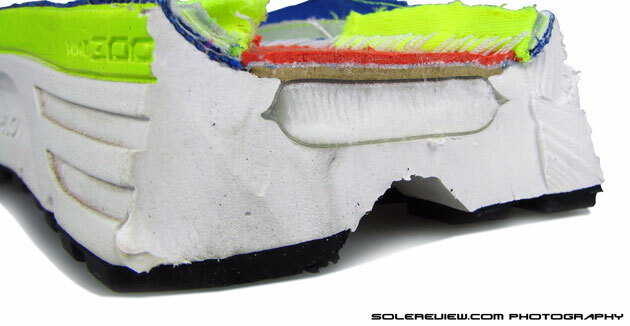 @solereview:disqus Do you want my picture of Vomero 1 with glitters? 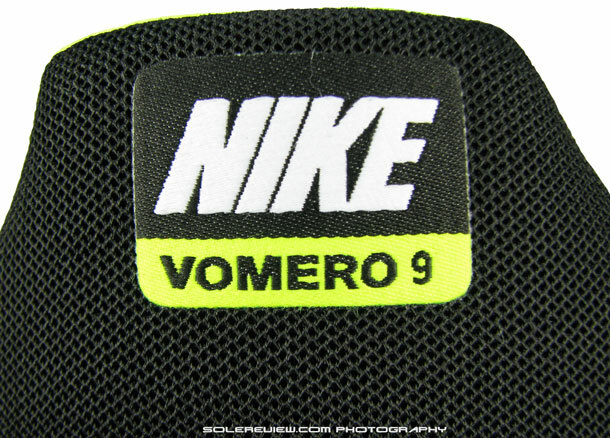 Moreover, given that the Nike+ sensor reserve space has gone in Vomero 9, if Nike brings back Vomero 11 with full length Zoom air combined with full length Cushlon and heel to midfoot crashpad, I’ll be sold even though Nike decides to mark up the price a bit. This is my Vomero 1, together with my mum and my sister’s Roxy double pencil case and sandals, all with glitters. Enjoy. Hi Henry, think there was some problem with the image upload, could you please try again? I think I can’t upload my image properly. Sorry. It works now. Thank you and help me delete the two previous comments from the “Guest”. Thanks a lot! This is my Vomero 1, together with my sister and my mum’s Roxy pencilcase and sandals. Enjoy. Thanks for sharing the pictures, the Vomero looks to be in great condition! You’re welcome. These photos were taken in 2009. My Vomero 1 was retired in 2010. My zoom Katana Cage iii in these pictures had been thrown away due to bursts in both zoom air. Pity they’ve stopped making caged Zoom models anymore. And the next Vomero 10 should be much better, hopefully. Yes, it’s a pity that they’ve stopped making caged zoom running shoes anymore. At the turn of 2009 to 2010, I was preparing for half marathon races and marathon races with my Katana Cage 3 but unfortunately one day the Katana Cage 3 flattened silently. It died too young. I replaced the Katana Cage 3 with Lunaracer+, and I ran a 2:47 marathon with Lunaracer+ before I retired them. I am considering of purchasing Vomero 10 as it sounds good. Also, the cellulose cardboard above the zoom air unit in Vomero 9 is such a hideous, sub-par design. I think Nike has no problem of coming up with more advanced heel design. Maybe the Vomero 10 does away with the cellulose board? Let’s wait and watch. 2.47 marathon is pretty solid, and we loved the original Lunaracer. Super lightweight, with genuine Flywire panels on the sides. Not the cord based ones on the LR3. My Lunaracer+ is made up of Lunarlite instead of Lunarlon. The midsole is in pink and I just love this original version very much. Thanks for your tips. Some of those models are not available where I live, in Portugal. Today I tried running 24 km with a pair of Asics Nimbus 14. I felt more cushioning than with my old pair of Vomero 5, but the Asics gave me blisters under my arches, which I found odd, but maybe it’s because I wore a size 10.5 when my correct size is 10 for running shoes (9 for regular shoes). Funny enough, I also have a pair of Asics Kayano 19 size 10.5, which I know now I shouldn’t wear since I have a neutral stride and those are motion control shoes, although I never got any blisters wearing the Kayanos, even in long runs. Would it make any difference if I tried a pair of Nimbus 15 fit to my size ? What do you think ? Se me permite a sugestão, creio que devia optar, ou pelos Nike Pegasus 31, que consegue encontrar muito facilmente em Portugal, ou pelos Adidas Energy Boost ESM, muito embora este modelo, em particular, talvez não seja tal fácil de encontrar. Seja como for, aconselho-o a comprar qualquer um dois referidos modelos meio número acima do seu número habitual. If you will allow me to suggest, I believe that you should choose, either the Nike Pegasus 31, which can be found very easily in Portugal. Or the Adidas Energy Boost ESM, although this model in particular may not be so easy to find. That said, I will advise you to buy either of these two models a size above what you would normally wear. Sorry for that, I got a little carried away. Will not happen again. Keep up the excellent work. All the best, PM. So happy to hear it worked out for you, thanks for coming back and sharing! The Nimbus 15 is definitely more comfortable than the 14, but then – we don’t know what caused the blisters in the first place, so can’t say for sure. Thanks for sharing your experience. Glad to hear they’re working out well for you! I’ve just had a pair of Vomero 9’s delivered. But after reading your review, and as I need to send something else back anyway, I guess it’s a no brainer that I should get them changed for, say, the Pegasus 31s. I’m just looking for an all-round good shoe to run in on various surfaces but mostly pavement. What about the Zoom Structure 18s? What would you recommend the most out of the nike running range? We might have slammed the shoe for Obsolescence, but there is nothing wrong (functionally) with the Vomero 9. If they are comfortable and fit well (for you), then keep them. Otherwise, as you pointed out, the Pegasus 31 is a great all rounder, and something we’d personally pick out of Nike’s existing running line-up. The Structure 18 is good too, just a little hard on the ride. Thanks for the great reviews and advice! I actually think the Pegasus looks better – I only really got the Vomero as it was on clearance, but the Pegasus is actually cheaper new! You’re welcome! The Pegasus, then it is. Good review. But… I think it is a little remarkable to dislike the Vomero so very intensely and to love the Pegasus so intensely all at once. After all, they are so similar that you use illustrations of the same cut through for both. Having both, I find the Vomero fits my wider foot better. It is more plush and springy than the Pegasus, but otherwise very similar in feel. The Pegasus is a little lighter and harder, which many like, but it also mildly hurts my foot at times. I see points are taken off for not “updating” the design at least bi-annually. I think this is a mistake, which re-enforces one of Nike’s worst practices, which is to change the design for no reason. Frankly, I don’t care if the sole or upper was designed in 1492 or 3 million BC if it works and feels right. The human foot has not changed much from year to year. So if they keep a good design (like the Vomero 3?) they should get points added, not subtracted. Thanks for the feedback. The point here is that the Vomero does not feel anything like the 3, which represented the fundamental objective behind creating such a product. Which was to provide an extra plush feel, both in the upper and sole unit. Sadly, the Vomero 7-9 fails to deliver on that front. And the fact that Nike hasn’t bothered to make corrections in three years is an issue, and a case for taking points off the score. From a ‘whats-expected-from-a-vomero’ perspective, the shoe fails miserably. We reviewed the 3 back in 2008, and the recent versions are far removed from it. The Vomero 10 video has been removed (since we posted screenshots here), but it had one of the Nike executives talking about how they wanted the Vomero 10 to be a nod to one of the earlier models, which delivered a plush, luxurious ride. And how the Vomero 10 was a step back in that direction. So apparently we’re not the only ones who feel that way. Nike does too. I currently run with a pair of pegasus 26 which are good but old. I would like to get vomero and not the new pegasus because I want cushioning in forefoot and wide shoes (my feet are flat and a bit wide). Otherwise I tried asics, NB, but it’s too tight. Maybe Brooks but it’s hard to find a shop. Do you think Vomero could fit me ? How about Saucony’s? Are they hard to get in your area? The Ride 7 has a fairly roomy upper. The Vomero 9 runs a bit snug. And which Nimbus did you try, was it the 15 or 16? This week-end, I should go to a shop that sells saucony. I tried the nimbus 16. You could also try the Nimbus 15. No, I can’t find them. Why ? Are they wider than the 16 ? The materials make them feel wider than 16, and softer too. Trade off is heavier weight. Ok even if my weight is only 75 kg ? Even then, the change is noticeable. Thank you for your honest and unbiased review of Vomero 9. I couldn’t agree more with some of the faults and I wish they bring the cushioning from the first vomero models. Fingers crossed the Vomero 10 does that, however on the mean time as a underpronator/sup ( high arch as well ) could you please recommend other models I can try ? Would you recommend the Pegasus 31 ? Any other trainers ? Asics or ? I am 36, tall, do weight training run twice to three times a week in concrete or road ( Central London )or occasionally treadmill and weight 97kg if that info helps ! Thank you in advance! Happy to hear that you like what we publish! a) Hoka One One Clifton – its soft ride blows everything else away. Cons – tight forefoot. b) 2013 Asics Gel Nimbus 15 (last year’s version): Plush upper and ride, but heavy. d) Pegasus 31: Good all around shoe. e) Brooks Transcend: Consistent, well spread cushioning, but with shallow upper fit. Zoom air Unit in the heel” compare to two zoom units in Vomero 9? Another source suggested to try Air max 2014 for cushioning as I run primarily on a pavement . what is your opinion on that? The Pegasus and Vomero don’t feel all that different in heel cushioning, the Pegasus actually feels more cushioned during runs because of its deep, lateral groove. Yes, the Vomero has two air bags, you’re correct. The forefoot Zoom air only makes a difference if you’re forefoot striking on the Vomero. Otherwise, it’s just another layer of midsole for the foot to go over before toe-off. That said, Vomero feels slightly softer because it uses blown rubber under the forefoot, as opposed to hard lugs underneath the Pegasus. Air Max 2014 (and also the AM 2015) are bulky, stiff shoes, we won’t recommend spending so much. The Hoka Clifton will do for you nicely instead. Earlier Vomeros (till version 6) used to come with a separate heel crash pad, making the ride feel more cushioned. ok thanks, so the Vomero 10 would be more comfy than the vomero 9’s in your opinion? Should be… the Cushlon crash pad sure looks chunky. Not a big fan of the new upper, because it won’t be plush, if our Structure 18 experience is anything to go by. Well I started with the Vomero 6 and then the 7, which is in my personal hall of fame because it never wore out, only wore down a little in over 1000 miles of running including a road marathon and rocky trails. So I’m a little disturbed by the idea that a shoe needs to be overhauled in every iteration. From the sound of it, I won’t like the 9 because of the tighter heel and upper and probably won’t like the 10 because same and extra cushioning. I’ve tried the Gel-Nimbus 15 but it doesn’t support my arches enough and just feels slow and unresponsive. I’ve tried the Nimbus 15, also. My thoughts are the same as yours, needs a little more arch support and feels slow. I do like it better on the treadmill than I do outside for some reason, not sure why. I’ve read that Gel-Pursue is supposed to be more responsive and am considering that one. Doesn’t sound like the author here thinks much of Vomero, scared to try that. I have been running in Wave Riders for a while, but don’t like the most recent iterations very well. Don’t be scared 🙂 See our ‘Tester note on review ratiing’ section at end of the review (before the Vomero 10 pictures). Thanks, that makes sense. The lack of updating doesn’t really effect the suitability of this shoe by itself. Also, I really like the Vomero 10 photos and may want to wait for that version. Nice find getting those photos, I don’t think they are widely available right now. I’ve never had the ‘flyknit’ upper on any of my shoes, but it looks like it would really work well with your foot. Yes, that was a lucky find. After our pictures went online, the Vomero 10 video was taken down soon after. There is a reference for how the new Flymesh upper will feel – the same material has been used in the Structure 18. Thanks for the feedback. One of the issues we have with brands carrying over majority of parts over is that none of the cost savings seem to be passed on to the consumer. That said, our score does not reflect our personal opinion (on overhauls). 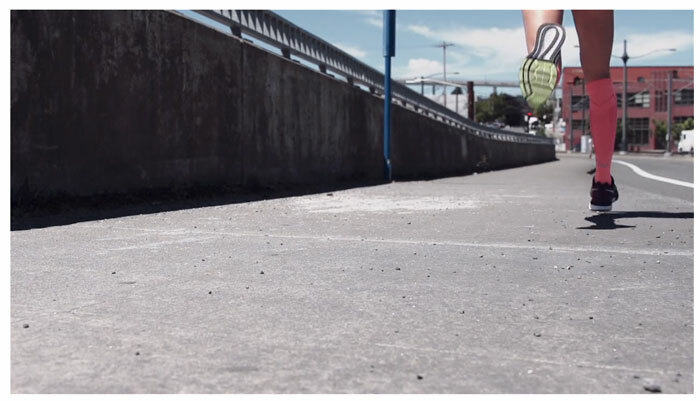 The Vomero 9 is a structurally sound, cushioned shoe, with good levels of outsole durability. Nothing wrong with the shoe, when looked at from a stand-alone viewpoint. Any more leads on the Vemero 10 release date? Really wanting to wait for these but I’m afraid the wait might me to long. Should be March or April. Thanks, thought would be sooner though. The V-10 has already started showing up in warehouses. Already on sites like roadrunnersports, but no official launch. why did Nike abandon the great shoe they created with the Voomero 3 and will they ever return to a shoe of this character and quality? Think that ship has sailed for good – the Vomero 3 was the last of its kind. – Looking for some advice about the pegasus and the vomero 10. – Had been running in pegasus and vomero’s from 25 o 26 and 3 respectively. alternating between the two daily. – picked up the pegasus 29 and vomero 7 late 2013. I have been too scared to go back to them for fear of injury. is it safe to go back to the pegasus 31- is it back to more of the 28 feel? Will it be safe to go back to the Vomero 10, is it back to a more pre-7 feel? Always hard to provide a single answer for these problems, because there might be more at play here than just the shoes. But we can layout the differences between the Pegasus 29 and 31. Peg 29’s midsole carried over to the 30, so our Pegasus 31 review is a good place to see how the cushioning has evolved. In short, the Pegasus 31 is a firmer version of the 29. We don’t have thoughts on the Vomero 10, because we haven’t tested them yet. We should havethe review up sometime next month. On the face of it, you seem to have trouble from wearing soft shoes. So how about laying low on the softness for a while and transition to firmer shoes? Models like the Saucony Hurricane ISO come to mind. Also, what kind of conditioning/strengthening exercises are part of your regime? I would like some help please because I am lost! I currently have the Vomero 3, and I love them. I don’t run much, mostly walking several miles, and I primarily want a very cushioned shoe. Several years have passed since hte Vomero 3s, and in search of new technology I thought I’d try how the Lunarlon does. Well, I cas very dissapointed with the Lunarglide 6 I tried in the store, they seemed pretty stiff to me. I tried the Vomero 9 and it feels OK but nothing special. I also tried the Pegasus 31 that everyone praises (plus they are cheaper and more pleaseing to the eye to me) and they were pretty fine but a liiiiitle bit stiffer, plus the absence of front zoom unit is noticable to a walker. Is there some other Nike show that would fit my cushion needs better? 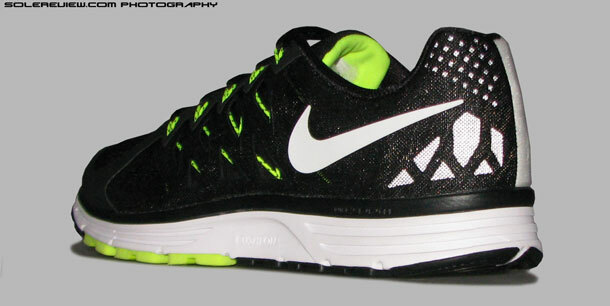 Maybe a combination of Lunarlon+zoom air would be even more cushioned than vomero? There’s nothing in Nike which can replace the Vomero 3 in fit and cushioning feel. That said, you could try the Flyknit Lunar 3, which feel soft and responsive. If you want something very cushioned right now and willing to sidestep Nike, then look no further than the brand new Asics Gel Nimbus 17(our review next week), which is very soft. Then I tried the brand new adidas ultra boost and I must say I was exstatic! They really are the softest shoes I have ever worn! I read though the review here on the Pure Boosts that was very negative and I dont know if the ultra boost will be good longterm… If they are a decent overall, I think I have found the perfect match for me… Have you tried them? Any opinions? Nimbus 17 is much softer than the 16, and hence softer than the Kayano. The Ultra Boosts are soft and the upper fits well for the most part. While the Pure Boost was a horrible running shoe, the Ultra fares much better because of certain design enhancements. Would you characterize the Nimbus 17 or the Ultra boost as softer? I am between those 2 currently. I have tried the Ultra boost and they cover me as far as cushion goes (only need to read a decent review about their overall performance). I also like their appearance. And I will try to find the Nimbus 17 to try them out, but they are not yet available in Greece… Good thing is though they are not as bad looking as the Kayano, I even liked the Carbon-red scheme of the Nimbus. Both are soft, but in different ways. The Nimbus feels pillowey, while the adidas combines softness with a responsive overtone. Yes, the Ultra is a proper running shoe. More details to emerge next week when we wrap up our review. Still testing, so need more time to get a proper read on both the Nimbus and Ultra. I’m usually agree with all of your reviews, but I don’t necessarily think you guys were fair to this shoe. It’s not the Vomero of the past, but like you point out, it’s a solid shoe when not compared to its earlier versions. I do appreciate the in depth nature of your site and even some comparisons you guys do (all the current asics and brooks reviews and comparisons yo one another were stellar), but this one seems less objective than your others for some reason. I think this shoe, while definitely not the 3, would work fine for a lot of people. Anyway, hopefully this didn’t come off trollish; love the site! You are the best review site in the web, and I’m glad you are open to discussion. Not a lot of reviewers are. Keep up the awesomeness!!!! We’re as critical of ourselves as we are of performance footwear. Constructive criticism is what we love most from our readers – nothing is more helpful than that. Because we know that solereview is good right now, but far from great. Which leaves great scope for improved content. Looks like Vomero 10 release date is April 23. When do you think you will have a review up for this shoe? Thanks. Likely mid- May, since we’re only able to buy it after the official launch date. hi Solereview. excellent detailed review. I’ve run in Vomero’s for the past 6+ years. I’m 5’10”, 85+kg, a forefoot runner. 4 years ago I was in an accident which fractured my sacrum and sacroilliac, so I’m fussy when it comes to runners. I need a neutral shoe that has stability and cushioning (in terms of nike, more zoom than lunar) in both forefoot and heel. Oh, and I’ve recently moved from Europe to a hot humid country (average temps 30+) in Asia where they dont sell my size shoes, so I have to buy online. Plus I dont wear pink shoes, ever. Any recommendations? Cushioning and stability? Models like the adidas Supernova Glide Boost 7, UA Speedform Gemini are top of the mind recalls, though they run noticeably firmer than Vomeros. Wished we could have offered an opinion on the Vomero 10 too, but a full review is around a month away. I go every week to a running group that a store has near me. While we are waiting to take off i have been viewing the shoes and i see that the Vomero looks very similar to the Pegasus with the zoom style heel. Other than those features and cosmetics they look like virtually the same shoe. My girlfriend and I have tried them both on in the store but its not like we can go for a run without buying them to really tell. I wont stray from the pegasus no matter what number it is 29-31 because they are all comfortable and my inserts fit well in them (i also run really hard and have high arches). She has a high arch as well and wants to try something new. is this the route to take? we have both been stuck on wanting to try lunar glides as well and are not sure about those either? While the Vomero might resemble the Pegasus in an area or two, it is a softer shoe. Because of the foam used under the heel, the extra Zoom bag in forefoot and the softer blown rubber on the Vomero outsole. 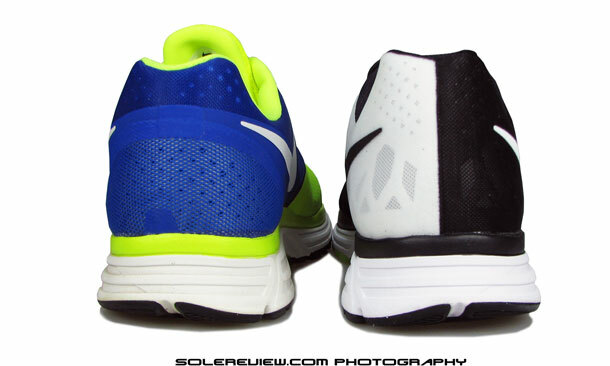 The Lunarglide 6 on the other hand, is a firmer shoe than both the Pegasus and Vomero with a narrower heel fit. So the choice of shoe depends on what your friend wants – if it is soft, then the Vomero is the way to go. If she needs more stability/firmness, then the LG6 it is. I have the volmero 10 here and giving it a whirl..look forward to reading your 10 review! What do you think of it so far? Our review will only be up sometime in May. First off, Ive never ran in a volmero before so I have no comparison point of past designs. I was looking for a lighter weight shoe but i decided to give this one a try. Out of all the level 5 cushioning shoes I like it the best. The heel is firmer with very low flexibility and seems to guide you through your step to the forefoot. The forefoot is very cush, a bit thicker than what I like personally, but its pretty soft. I did find it to be moderately responsive. And the toe box is pretty roomy, I didn’t have much complaints about the upper construction. For longer runs its nice. Ive had a major injury and I would say I felt very protected in this shoe. I actually sent it back to roadrunners cause im looking for a lighterweight shoe (and needed the store credit) but I can say that I may come back to it later. To me it was a much nicer experience than the Pegasus 31. Appreciate the detailed insight Tracee, hopefully our impression matches up with yours! Looking forward to review the shoe soon. Love your reviews here guys. Do you happen to know if Nike will offer the Vomero 10 in Nike id (customized). I was able to try the 10 locally and like the feel but do not like the looks. Nike is impossible to contact it seems. Looking forward to your review on the 10 as well. Thanks. Not sure, but logically it should (eventually) show up on Nike ID – because the Pegasus 31 and Structure 18 are customizable. Our V-10 review should be up in May. Hi there. Love this site and all the reviews. I have ran with the Vomero 5 for the last five years or so. I have been buying new versions of my size through ebay. Unfortunately, I think this has come to an end. I simply can’t find them anywhere new anymore. Ive tried all kinds of others in hopes of finding something comparable. I return nearly everything. Tried the Vomero 7/8/9…..hated them all. Tried the Brooks neutral shoe….returned, tried the new saucony top of the line neutral shoe….created a weird blister on the ball of my foot…returned it. At the running store ran with mizuno neutral didn’t like them. I am at a loss. I have literally gone and tried and returned probably around 6-8 pairs. Please help….need a new shoe that I can actually buy with consistency! Have you tried the Vomero 10 yet? The 7/8/9 were based on the same sole unit, so all of them ended up feeling the same. Seems to me you are bitter that you didn’t get this shoe for free. The Vomero has made numerous changes over the years, and is the shoe of choice for those who are sponsored by Nike (such as my 2:36 marathon wife) as well as top runners who buy their own shoes. The Vomero 9 is fast enough for road speed work with the protection to pound out the miles. Additionally, unlike many competitors, this shoe lasts – she gets 600 miles before needing replacement. Full disclosure – I’m not a Nike runner, and I wear Karhu shoes. But if I wore Nike, clearly the Vomero would be the shoe I would use. A couple of things. First, we don’t rely on free shoes for our reviews unlike most shoe review websites, and we rather not, as it gets in the way of unbiased reviews. Two, was our review a little harsh? Maybe so. Everyone is entitled to their opinion, and the review above is what we think of the shoe, with ample substantiation of viewpoint. Do you have to agree? Not at all, and happy to hear that the shoe worked so well for you. And is the Vomero 10 a great update? We absolutely think so. Feel like the odd man out here, given all the complaining about what I think is a consistently superior shoe line. I’ve worn Vomero 3, 6, 7 (i had 2 pairs of these) and the latest was the 8. Each version has been a delight compared to other running shoes I’ve used (Rides, various NBs and ASICS). I pretty much will choose Vomero over any other shoe line for its comfortable and durable performance on my feet. NOTE: my runs are 3 to 4 miles 5 or 6 days a week. If I ran greater distances, then durability might be an issue. With nearly 8 years in Vomeros, at age 53, I am injury-free and running as strong as I did in my late 30s. Thank you Nike. Thank you for your feedback! Have you tried the Vomero 10 yet? You’ll probably love those too. No, but I am VERY interested in doing so. I’m not a “check your brain at the Nike shoe store” runner. I started many years ago running in Adidas, Brooks, Pumas, and ASICS. I’m talking the 1970s here folks. So I’ve been at it for almost 40 years, with only one injury (pleica in my right knee). Then in the early 90’s I started with Skylon TCs and that was a great shoe. Vomero 3’s were, to me, a real step forward in a cushioned running shoe. If the 10’s represent a similar advance, that is a true credit to Nike’s development team. Vomeros help me to ‘baby’ the tendons, ligaments, and bones of my feet and legs. I never run on asphalt or concrete unless for a race. Otherwise I run on grass or the beautiful crushed rock/pea gravel running trails prevalent in my town (Columbia, MO- a great place for runners). I run for speed, not distance, to minimize potential for overuse problems. To top it off, the Vomero’s superior cushioning and comfortable uppers transform running with intensity into a great daily renewal ritual for me. Sincerely appreciate your detailed and straightforward shoe reviews! Wow, that’s a long time of running! Don’t even know how the Skylon TC’s look like, though we’re familiar with the ’91 Air Skylon and the Zoom Skylons in the mid 2000’s. The Vomero 10 isn’t as plush feeling as the Vomero 3 due to several design changes, but it still packs in a great balance of cushioning/support without being heavy. Certainly better than the V7/8/9, all of which were the same shoe in terms of midsole ride.